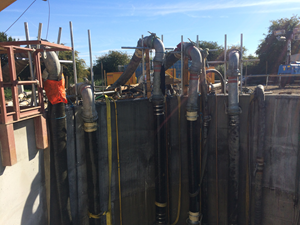 Burpham Strategic Water Main contract involved the construction of 6.5km of potable water main. Once commissioned, the new main was set to deliver nine million litres of water a day from Burpham Water Treatment Works to a population of over 19,000 people in the area. 2No. 8m diameter Launch Shafts 11m and 20m deep respectively. 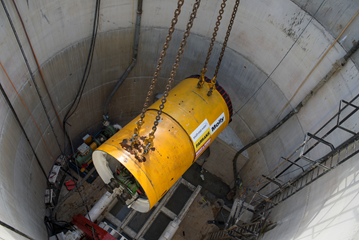 300m tunnel using an AVN 1600 (100m under the M20 motorway and 200m under the River Medway and adjacent Network Rail lines). 1600mm ID concrete jacking pipe installed. 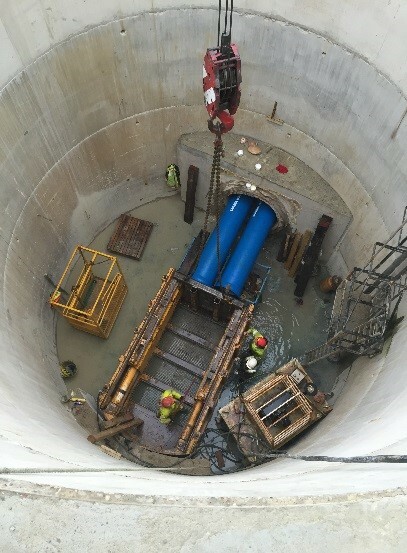 Bottom screed and carrier rails along full length of tunnels to allow installation of twin 600mm ID ductile iron pipes, with use of hydraulically operated jacking frame. Bulk headwalls/thrust blocks and pressure test pipelines. 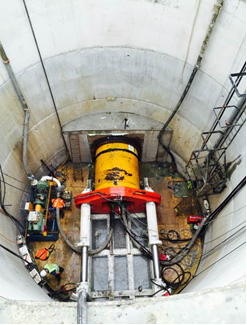 Grouting of the annulus between concrete jacking pipe and ductile iron pipes along full length of tunnels. The abrasiveness of the sandstone rock (described as Abrasive to Extremely Abrasive in SI) caused excessive wear on cutting tools. Spare cutting discs, rippers, mounting frames and appropriate tools were on hand at all times for any changes required. 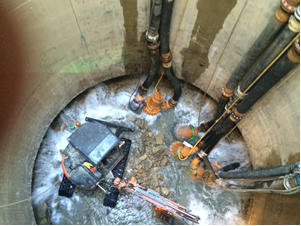 Water levels encountered at 3 – 5m below ground level in areas where no water was reported in SI, resulted in up to 750 l/s of water being pumped out of shaft during the sinking process once sinking in rock and up to 1.5 bar of pressure acting on the TBM. Soil / rock interface reported at levels up to 10m below those where encountered at certain locations. The productivity during sinking process of caisson was significantly reduced. Work was carried out on a day & night shift basis to keep the programme on track. Soil / rock interface reported at levels up to 5m above those where encountered at certain locations. The construction methodology for shaft was adjusted from underpin to caisson method with little delay to programme.